Boys Bedroom Ideas | Decorating boys bedroom might be one of the most difficult jobs for a parent. It is even more difficult than decorating the master bedroom, since boys are not like girls, some boys do not really care about how their room should look like, while some want to decorate the room the way they like. 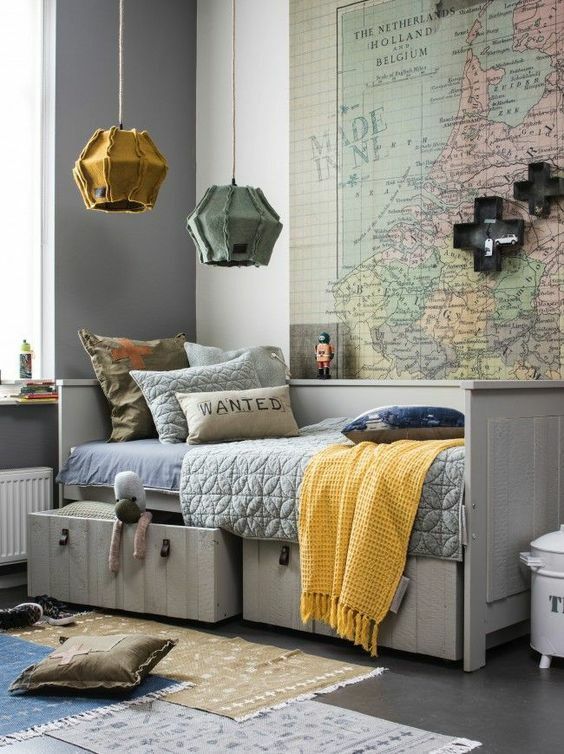 Decorating a boy bedroom is not only about choosing the right bed and furniture. You need to pay attention to the color palette, the decoration, and the room style too. Everything has to be matched with his personality. You might need to consider you boy’s hobbies too. The most important things you need to remember before decorating your boy’s bedroom is, you need to consider the trends too. An outdated style is not something your boy would like, but in the other hand you also need to make it comfy and cozy too. Are you confused how do you suppose to decorate a boy bedroom? Well, we have these 20 boys bedroom ideas as your solution. Check this out. Black and white style never gets old. You can paint the wall in white and cover up the bed with white sheet and blanket with black pattern. If your boy is still so little and likes to play, you can also add a decoration tent your boy can use to play. Don’t forget to put some pillows in the tent too. You might also want to decorate your boy’s name on the table. Do you think your boy is gonna like this boy bedroom idea? Why don’t just give it a try? Who does not like stars and does not want to be an astronaut? Well, almost every child has that kind of wish, maybe including your boy. 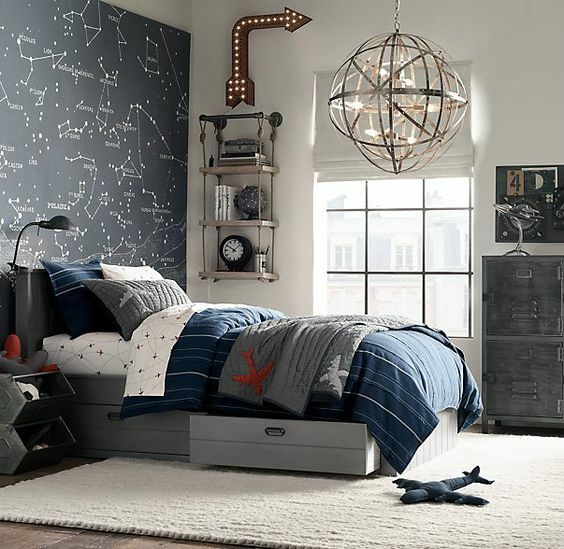 Decorate your boy’s bedroom with astrological signs and the bed with blanket and bed sheet with space ship patterns. Make him believe that he will be able to make his dream come true one day. If the astrological wall does not look so attractive, maybe you can try something different, like the world map wallpaper. You can paint the rest of the wall in white and decorate the room with some accessories and little plant to make the room greener. You can also add a decorative lamp on the table, which is not only make the room look more attractive, but also will help your boy to study. This colorful look is perfect if your boys are below 10. Instead of giving them a single room for each, why don’t try teaching them to share by sharing the room? Use the bunk bed, so it won’t take up too much space. Decorate the ceiling with stars which will glows at night when they turn the lights off, and make them enjoy their room together. Do you think your boys are gonna like the idea? Choosing a dark color like black is okay if you don’t have many furniture. Black and white will be perfect choice because these colors blend with all colors. A little monochrome touch will be good too. And if you want to choose dark color like this, you need to choose decorations that maximize your wall space. 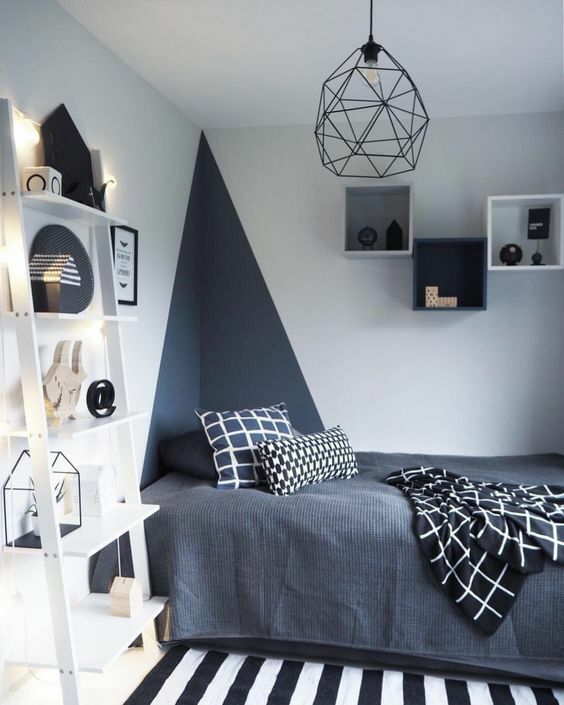 This boy bedroom idea is perfect if your boy is in his teen age. Do you want to try this idea? Who says sparkling Christmas light only becomes a girl’s favorite? Guys like it too, especially if your boy likes music. You can paint the wall in dark color to make the Christmas light more sparkling. Furniture with brighter colors can be perfect combination too. Don’t forget to make sure the room gets a good light too. 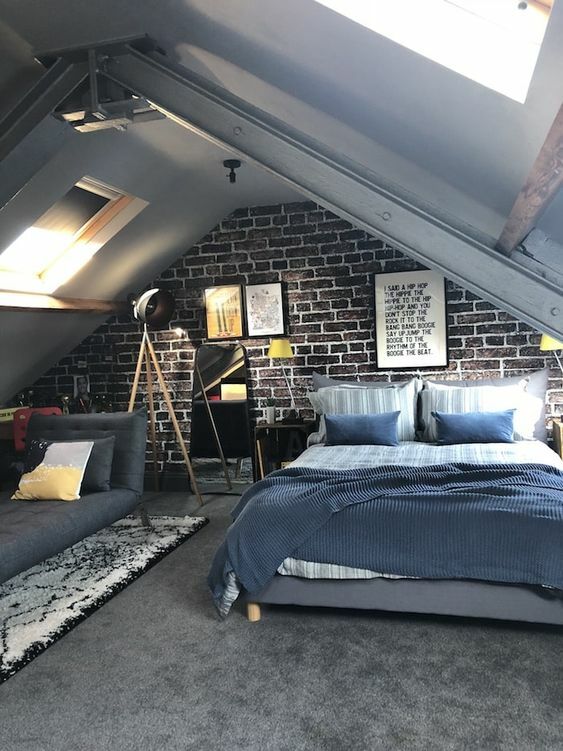 Who else is dreaming of having a bedroom in the attic? It sounds like a secret place when we were younger. For your boy, especially your teenage boy, a bedroom in the attic might be the coziest place. No need to paint the wall, and let the bricks show its natural beauty. Don’t forget to cover up the floor with comfy carpet and furnish the room with a cozy bed and a little sofa, so your boy can have a good time chattering with his boy friends in his bedroom. 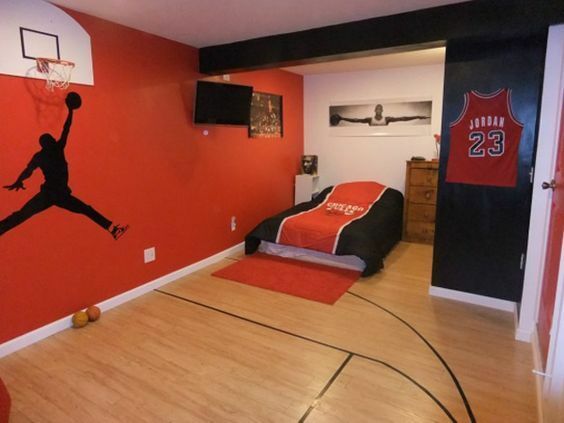 Do you think you teenage boy is gonna like this boy bedroom idea? 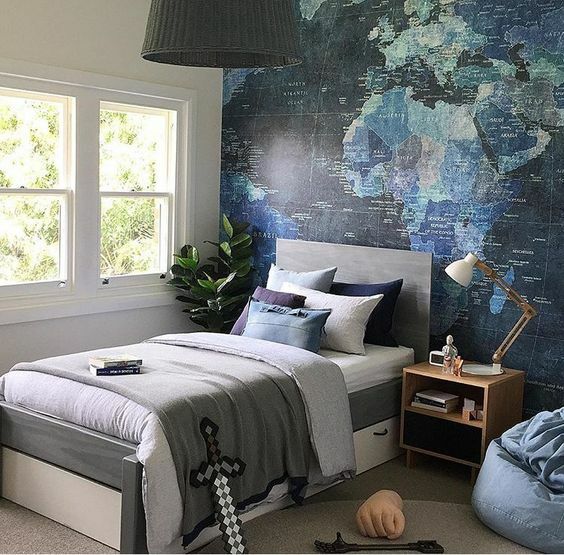 You can paint your boy’s bedroom in navy blue and cover one side of the wall with the world map. If blue seems too boring to be the color palette, why don’t try something bold? Like making a bedroom with british flag theme for example. All you needs are something white, something blue, and something very very red. So simple, right? Who says a boy cannot have a super red bedroom? Of course they can. You don’t have to paint anything in red, but some colors like white and black can be great too. You also don’t need too much decoration, since the color is already so eye catchy. Well, this style isn’t the style every boy would like. But, why don’t try asking your boy about it? 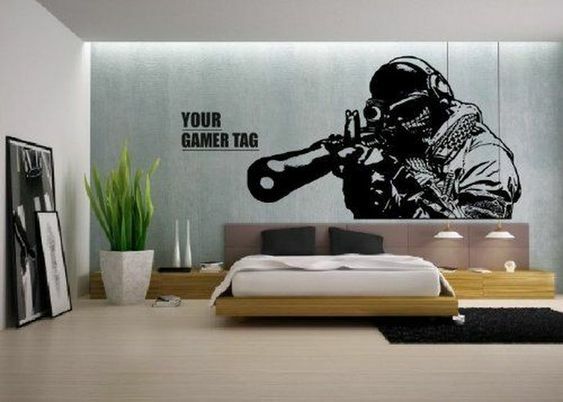 If your son likes gaming a lot, this boy bedroom idea might be perfect for him. The key for this look is the picture on the wall and the sentence ‘your gamer tag”. Then, to make the room a little greener, you can also add a green plant in the corner of the room. Do you think your boy is gonna like the idea? If your boy is a marvel maniac, this room decoration might be the best birthday gift for him. 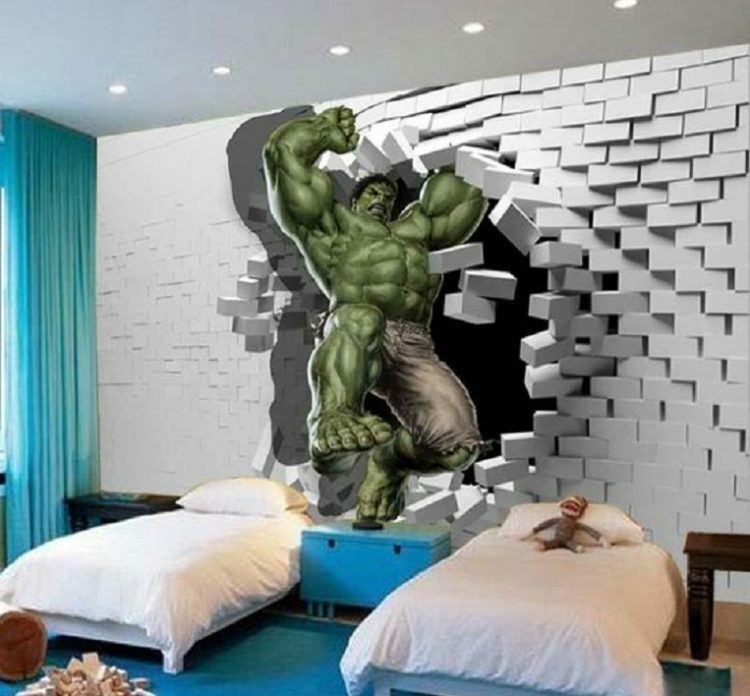 You don’t need any other decoration to make the room more attractive, all you need is just focusing on the Hulk painting and how to make it so realistic as if he is really breaking the wall. Well, this one looks a bit expensive though. But your boy is definitely gonna like it. Designing a room for a teenage boy? 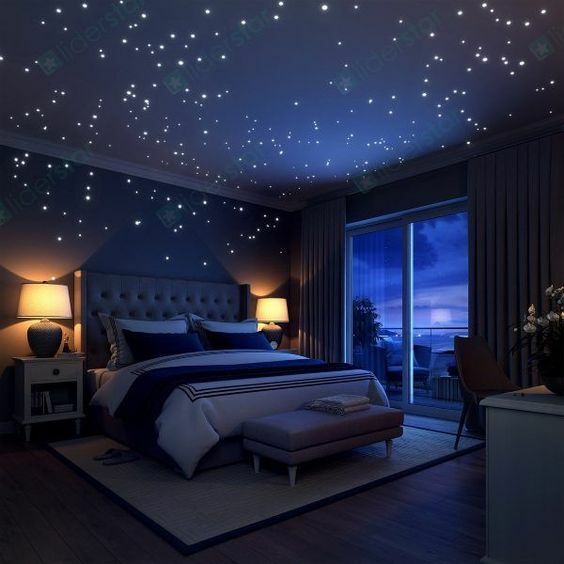 This starry bedroom might be perfect. This boy bedroom idea is not only perfect for a teenage boy but also for your boy who is going to the college. The stars on the ceiling will glow at the night whenever the light is turned off. Looks amazing, isn’t it? If your boy likes marvel but does not really like Hulk, you can try this Captain America-themed bedroom. 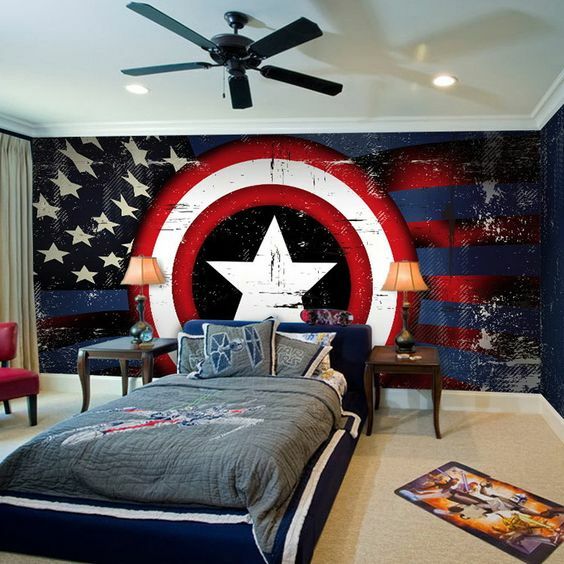 Paint the wall with the Captain America’s sign, set the bed in the middle of the shield, and put the twin decorative lamps on the left and right side of the bed. You don’t need any other decorations, because the Captain America’s shield itself is enough. Do you think your boy is gonna like it? Or do you prefer the Hulk idea? Boys love adventures a lot. If you have a room with high ceiling, why don’t you try installing some new adventures inside their rooms like wall climbing? Don’t forget to put on the mattresses below the wall climbing for their safety. If the room is bigger, you can also make a room for two by setting a bunk bed. Not only perfect place for adventures, this place will be a great place for study too. Don’t forget to put a studying table and chair near the window, to make them feel comfy studying in the day and install a studying lamp to make them feel comfy to study in the night. Your little boys are going to like this bedroom a lot. Your boy is a basketball player? Well, he looks like the type of that boy who doesn’t like staying inside his own bedroom. But, that won’t happen if you install a basketball ring inside the room. It doesn’t need to be like a real basketball field, but you can design the room like one, including painting one side of the wall like the basketball’s color, setting the floor like the gymnastic floor, and decorating the wall with basketball player’s photograph and team clothes. Well, sounds like your basketball player son is gonna like it. 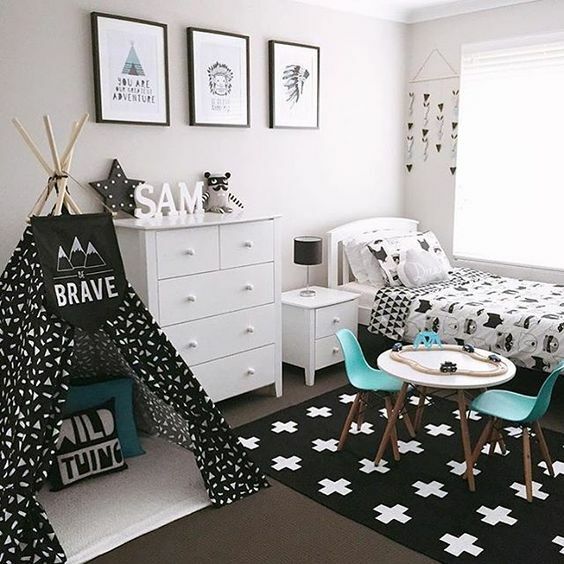 Are you going to design your boy’s room like this? The boyish looks are too boring? Why don’t try to decorate your teenage boy’s room with some different touch? Something their friends would admire if they are coming to visit, for example, decorating your son’s room with greens. You can put a big plant inside, a small leaved plant, and many other kinds of plants. 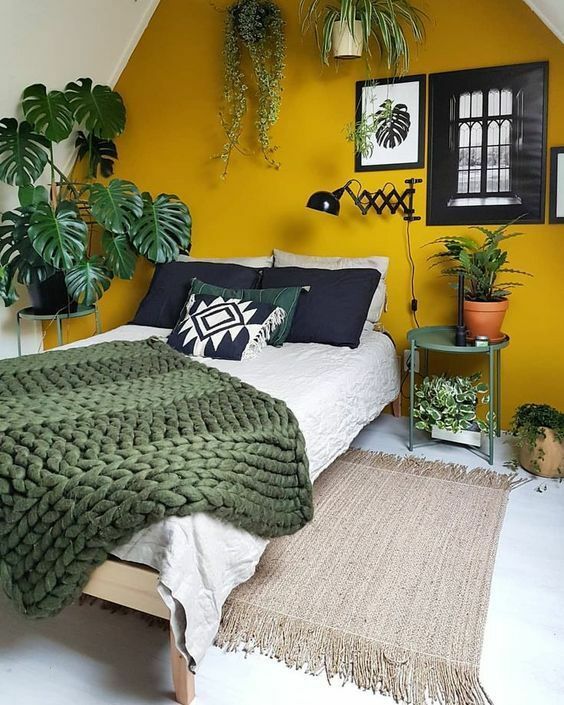 To make the wall looks attractive, you can paint one side of the wall with a different color, like yellow pumpkin color. Don’t forget to put a carpet on the floor to make the room a lot comfier. Do you think your son is going to like this boy bedroom idea? Don’t have too much space for your boy’s bedroom? Don’t worry. It doesn’t mean he cannot have a cool bedroom. Try to set a storage bed for him. Set it close to the wall in the corner of the room, near the window. You can decorate the wall near the bed with world map and hang some fancy lamps above the bed. Don’t forget to put some carpets on the floor to avoid making it plain too. Make sure the small room gets a good light. It will be better if he gets a big window. This will help his small bedroom looks roomier. 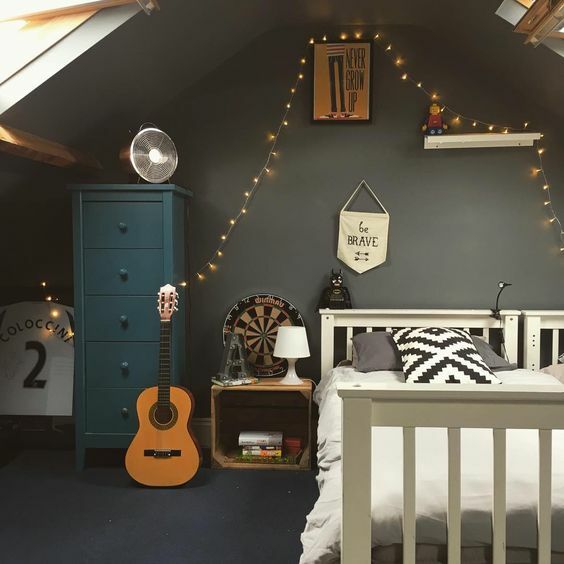 What do you think about this boy bedroom idea? Feeling like trying this idea soon? Boys like pirates and want to be one when they were younger. 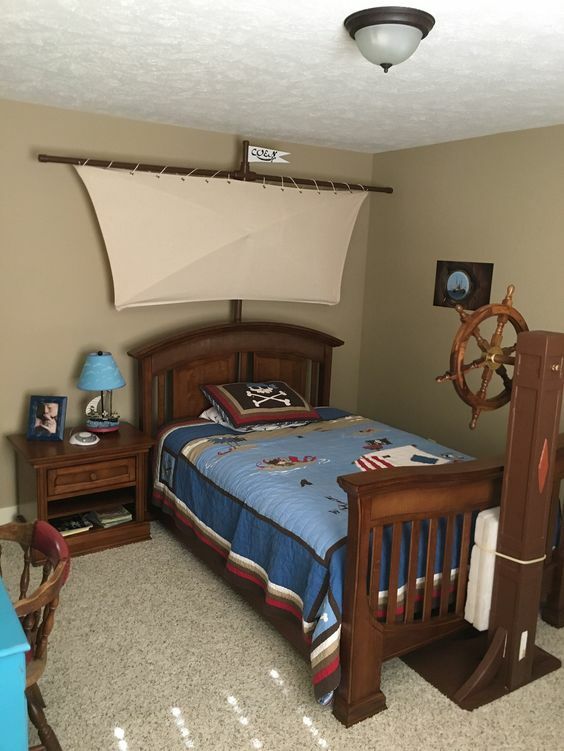 You can set your young boy’s bedroom with this pirate style. Set the bed like a sailing ship, cover it with pirate bed sheet. Since the theme is pirate, it will be better for you to avoid shining metals and start using polished wooden furniture. On the table near the bed, set a decorative lamp with the same color of the bed. It’s gonna be much better if you find other furniture or decoration with the same color too. 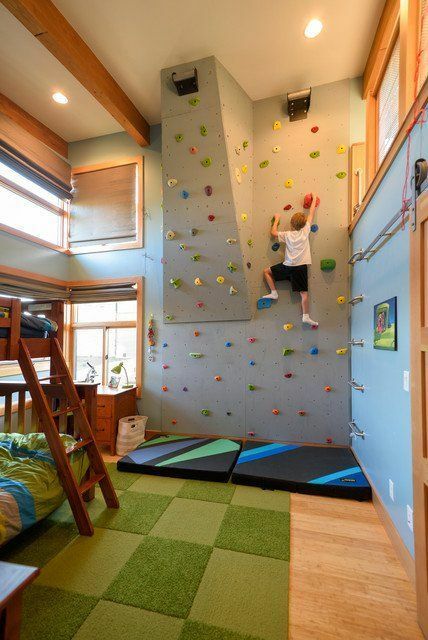 If your son is 10 or below, he is definitely going to like this boy bedroom idea. Wanna try this idea soon? Many boys are dinosaur maniacs, especially when they are younger. 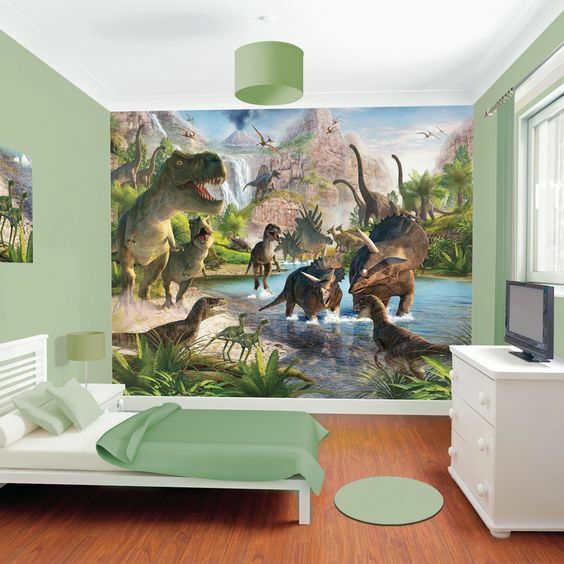 Why don’t you design your son’s room with this dinosaur theme? You can cover one side of the wall with dinosaur wallpaper and hang a dinosaur painting on the other side of the wall. Don’t forget to paint the wall green to make it blend with the dinosaur colors. A green bed sheet and pillows will be great too. 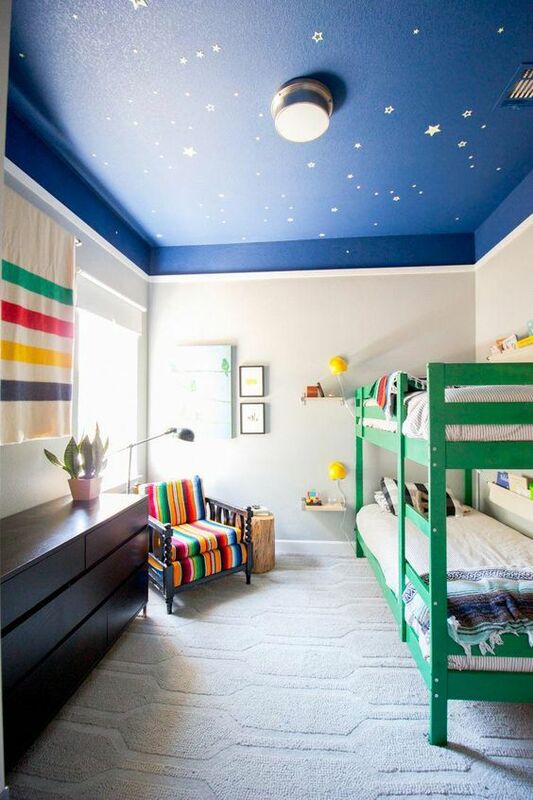 Make sure the room get a good light, so this idea will work perfectly for your son’s room. Star Wars never gets old, even if we do. 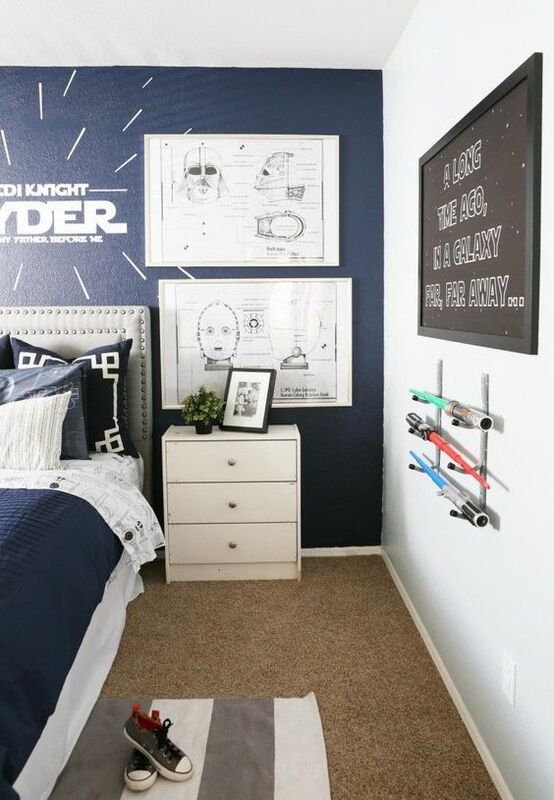 You can design your son’s room with this star wars boy bedroom idea. Paint the wall in light blue color and navy blue in the one side of the wall. Don’t forget to put on the sticker with that iconic font, saying “STAR WARS” on the wall. You can also add some decorations to the wall like lightsaber collection and Star Wars’ drawing. Don’t forget to consider the color palette, so this boy bedroom idea will work perfectly for this idea. That was the list of 20 cool boys bedroom idea you can try at home. Before deciding what style you are going to try, it is better to discuss it with your sons or anyone who is going to have the room. So, are you gonna redecorate your boy’s bedroom? Which boy bedroom idea do you like?